While there are gluten-free options out there for granola bars, it is something that I gave up when I had to go gluten-free. Why? I just didn’t find any that tasted…right…or good for that matter. Sure, there are plenty of fruit and nut bars out there, but when you think granola bar, you think of oats and that chewy-sticky goodness that you get with each bite. That was what I wanted. And that was not what I was finding. KIND once again rose to the occasion. I keep becoming so indebted to KIND because their products are superb. Honestly. I wouldn’t keep going back to KIND bars and KIND Healthy Grain Clusters time after time after time. Lord knows, these days there are plenty of delicious and gluten-free options when it comes to protein bars and granola. But there is something so spectacular about the products that KIND puts out. I trust them with my food budget. I really do. So, imagine my glee the day I stepped into my local grocery store and went to scope out the Manager’s Special shelves and found the KIND Healthy Grains Bars on the shelf. They had the discounted price ticket on there. The only flavor being offered at the discounted price was the KIND Healthy Grains Dark Chocolate Chunk Bars…so that’s what came home with me. Two boxes of them. That meant, without any idea of how they tasted…I invested in 10 bars (they come 5 to a box). But I didn’t even flinch…because it was KIND. Sadly, these just sort of sat in my drawer of protein bars and race day snackies up until the other day. I was working my way through the pantry that I totally forgot about those in that drawer. And, with my sprained ankle, I hadn’t been racing or running so there was no reason for me to open that drawer. It slipped my mind. Until…I started running again. I noticed the boxes in the drawer and knew it was time to bust them out for one of my work snacks. It would be just like the old days. A morning snack of a “granola” bar. But this…this is even better than a granola bar. It tastes better…has actual real ingredients…and it has more (and better) nutritional value. Trust me. I couldn’t wait for snack time to roll around the other day. Honestly. I had the bar out on my desk…anticipating it. Wanting to see if it was any good. Needing to know if it lived up to the high standards that KIND set for its products with me in the past. And when it was time, I tore into that wrapper and broke off a corner of the Healthy Grains Bar. The first thing I noticed was this didn’t snap away. The bar itself is very light and soft. You definitely get that hint of sticky-soft goodness from the honey, which helps to also sweeten the oats and other grains that are used in the making of these bars. The dark chocolate chunks provide this amazing sweetness that doesn’t detract from the rest of the bar, but works with it…bringing out all the other flavors. And I love that hint of coconut flavor you get right at the end. Honestly…one of the best bars I have ever consumed. EVER! Even better…I don’t feel guilty about this little indulgence, because it’s not really an indulgence. The name of this product says it all – HEALTHY Grains Bars. Add in that sweet hint of heart-healthy dark chocolate and you have my new favorite snack in life. So, what all goes into the KIND Healthy Grains Dark Chocolate Chunk Bars? Well, KIND never hides anything when it comes to their products. That’s why their packaging and wrappers have large open windows. They honestly have nothing to hide. At all. 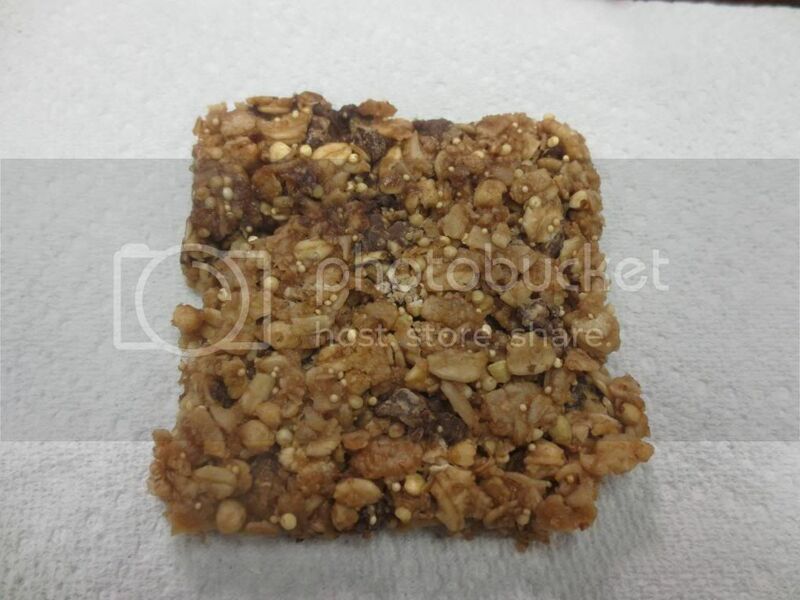 The KIND Healthy Grains Dark Chocolate Chunk Bars are a blend of whole grains (which include gluten-free oats, brown rice, millet, gluten-free oat flour, buckwheat, amaranth, and quinoa), tapioca syrup, evaporated cane juice, honey, non-GMO canola oil, coconut, chocolate liquor, sugar, brown rice syrup, molasses, gum acacia, sea salt, vanilla extract, cocoa butter, soy lecithin, and natural vitamin E.
How does it stack up nutritionally? Not too bad at all. A serving of the KIND Healthy Grains Dark Chocolate Chunk Bars is one bar. This bar will provide 150 calories and 4.5 grams of fat. One bar will also provide you with only 65 mg sodium and 9 grams of sugar. You will also be getting 3 grams of fiber and 3 grams of protein…so you actually do feel full after eating one. These are gluten-free and cholesterol-free. 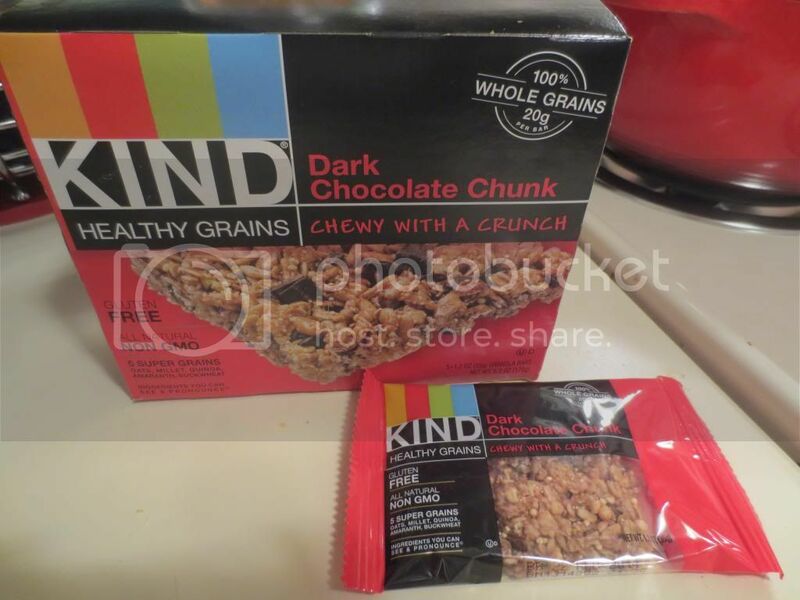 If you’re looking for a healthy snack that you can easily pack and take with you…anywhere…I highly recommend KIND Healthy Grains Dark Chocolate Chunk Bars. They remind me, a lot, of the homemade granola bars I used to make. Flavor is SUPER fantastic. Texture and feel is spot on. And that chocolate…tames even the biggest sweet tooth. My snack time just got a lot sweeter….without the extra sugar and…additives. Thank you, KIND, for products that I’m proud to have right out on my desk. This entry was posted in Breakfast, Chocolate, Clean Eating, Food, Gluten-Free, Granola, Products, Protein Bar, Quinoa, Review, Snacks, Sweet Stuff, Vegetarian by The Celiathlete. Bookmark the permalink.